I was blessed to have this article published in April’s edition of the South Carolina United Methodist Advocate, a great denominational paper edited by Jessica Brodie. I am grateful and delighted to share it. Thank you for reading! The buses pull up, and they disembark. First, the able bodied—those who can manage to step down and place their feet firmly on the asphalt of the parking lot; then the disabled—those who need a wheelchair or a walker or a ramp—all of them soldiers, men and women who served and sacrificed, all of them victims of the aftermath of war. They represent decades of skirmish, battles with different names yet virulently similar repercussions: post traumatic stress disorder, head and body trauma, addiction and mental illness. They served and now suffer, but a group of Midland Valley Methodists heard their cries and responded with grace and banana pudding. “It has to be at least fifteen years,” Mary Ann Scott explained, but when she turned to her friends in the church for a more specific date—no one was certain what year they began. Let’s suffice it to say—it’s been a while. Ray and Bessie Mae Chipley, dedicated volunteers at the Veteran’s Hospital in Augusta and members of The Langley UMC, saw a need and responded. They suggested the church invite the veterans to dinner, and their inspired work continues even after their passing. Their son, Tim Chipley, and his wife Evelyn, are among the many volunteers still serving today. They stand behind the long, white table, heavy laden with steaming crock-pots and a big box of fried chicken. They have decorated the tables with red, white and blue flowers and arranged for a singer to entertain their guests. Church trustee, Dave Puckett, weaves through the tables, greeting the veterans with a warm smile and a cold drink. He carries a pitcher of tea in one hand and a water pitcher in the other. “Sweet tea?” he asks, navigating the tight spots between the tables gracefully despite his football player’s frame. “It’s great” Dave responds when asked about his volunteer work at the dinners. “Proud to help” he adds. “It’s one of the best things we do”. It is also therapeutic. Caregivers from the Mental Health Intensive Case Management program at the Charlie Norwood VA Medical Center in Augusta need places like The Langley United Methodist Church to help support their clients and to provide spaces in the area where veterans can interact and find emotional support. It is described by the Veteran’s Administration brochure as an “intensive community-based case management program” and for that you need community. An active member of The Langley UMC, Joyce Duncanson helps provide that community. She works as the liaison between the church and the Veteran’s Medical Center. She makes the calls and keeps the quarterly dates straight and faithfully reminds the church of their connection with the veterans. Joyce also organizes the Young at Heart Club, so she understands the value of fellowship and how important it is for folks to stay connected to one another. She is busy in the kitchen on the day of the dinner, but she is smiling. Sitting around the table together, listening to the music and enjoying the food and the fellowship, being treated with kindness and respect, “it’s what we all need” Joyce confirms. Yet, sadly, many of the veterans suffered in isolation until they found their way to the program. The Mental Health Intensive Case Management (MHICM) program works hard to keep its clients engaged with others. Licensed practical nurse and social work associate, Aileen Blanchard, is one of the caregivers accompanying the veterans on the bus to Langley. She shares her appreciation for the church’s involvement in the program, explaining that one of their goals is to get the veterans out into the community at least twice a week. Her compassion is palpable as she describes her work with the seventy-five veterans currently enrolled. The MHICM program assists with a number of issues and services including, visits by social workers and nurses, crisis prevention and intervention, therapy and advocacy, medication management, assistance with housing and transportation—all with the goal of helping veterans achieve better mental health and social stability. In order to meet the requirements for participation in the program, the veterans must be stable medically and psychiatrically. However, all have suffered from serious mental illness and all have either experienced three or more acute admissions to the psychiatric hospital or have presented thirty or more VA psychiatric hospital days during the past year. A brochure about the program explains that the veterans suffer from a range of mental health issues including schizophrenia, schizoaffective disorder, bipolar disorder and major depression. A group of veterans linger outside the bus to smoke cigarettes, while others wait to get the assistance they need to navigate the journey across the parking lot to the church. Watching them file into the fellowship hall, it is not hard to believe they have suffered and that some suffer still. Finally, the buses empty and the tables fill. Veterans remove their hats and bow their heads and the ones who wish to participate say grace. Table by table they move toward the crock-pots and hold out their plates, ready for the lima beans and the cole slaw and the chicken, and for a moment it is all about the food, homemade by the faithful every four months. Claire Week’s famous chocolate pie sits next to the bowls of banana pudding on the desert table, and a veteran who remembers the pie from his last visit asks her to save him a piece. She chuckles and goes one step farther, carrying a slice of her pie to his seat at the table. 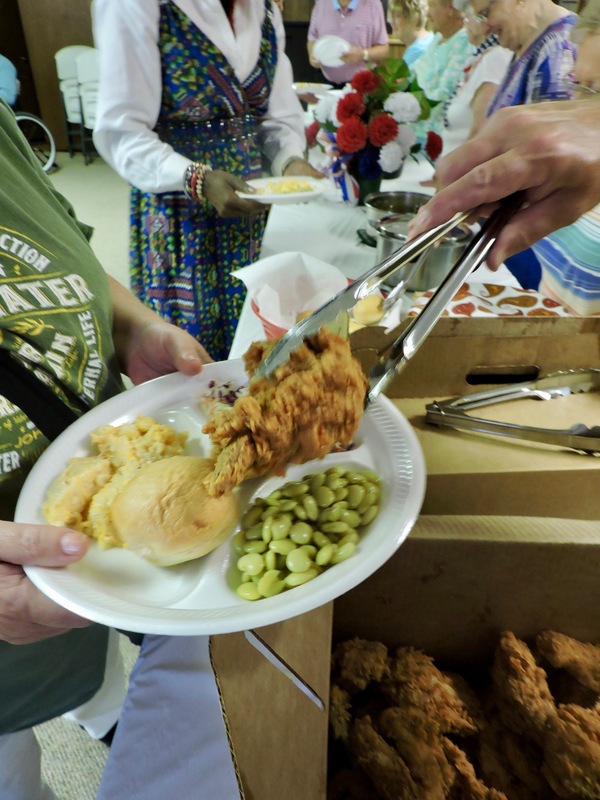 When most of the eating is finished and the singer’s last note fades, church members thank the veterans for visiting them once again, and the veterans respond in kind. “Thank you” says an aging soldier in a wheelchair and a Vietnam Veteran’s cap. “Thank you guys a whole lot” he smiles wide, and everyone feels the grace. A beautiful piece reflecting on the gifts of empathy, inclusion and outreach. The world would be a different place if such generosity was the default response to need, and if healing fellowship wasn’t just tribal, but universal.